MANILA - The longest bridge in the Philippines is set to break ground this year, a Cabinet official said on Thursday. Public Works and Highways Secretary Mark Villar said the groundbreaking for the Panguil Bay Bridge, which will link the city of Tangub in Misamis Occidental and the municipality of Tubod in Lanao del Norte in Mindanao, will start in October this year. Villar said the Panguil bridge will be 3.9 kilometers long, surpassing the San Juanico Bridge in the Visayas which is 2.2 kilometers long. "This will be the longest bridge to date built in the Philippines and it will be in Mindanao," Villar said in an interview with ANC's Market Edge." 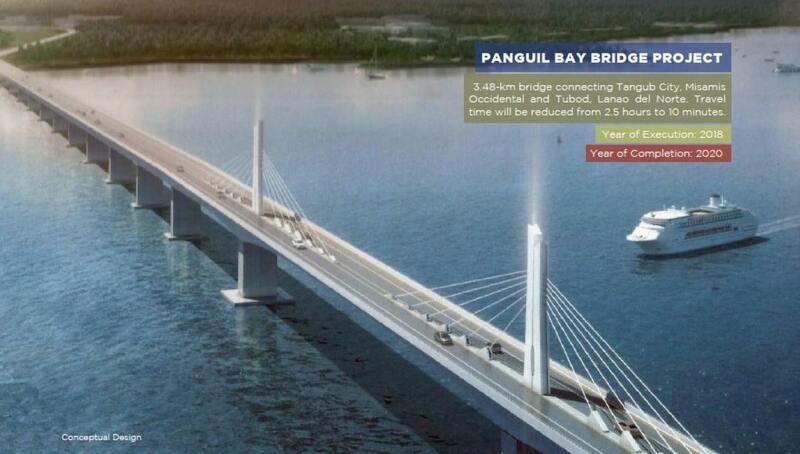 The Panguil bridge, Villar said, will be the first of 16 major bridges in the pipeline. The government's 'Build, Build, Build' portal says the Panguil bridge will cost P4.86 billion and will be finished by December 2020. Last April, Finance Secretary Carlos Dominguez said the government was planning 8 bridges that will link several islands across the archipelago, including one that will span 24.5 kilometers and link the islands of Cebu and Bohol. "By next year, we will have finished all the feasibility studies of these bridges. We'll know exactly the economic benefits, which ones are feasible, and how we will go about implementing it," Villar said.